Did you know that we now have our own Muckrach Whisky aged 10,15 and 21 years? Enjoy a dram in the bar or buy a bottle to make a great gift. 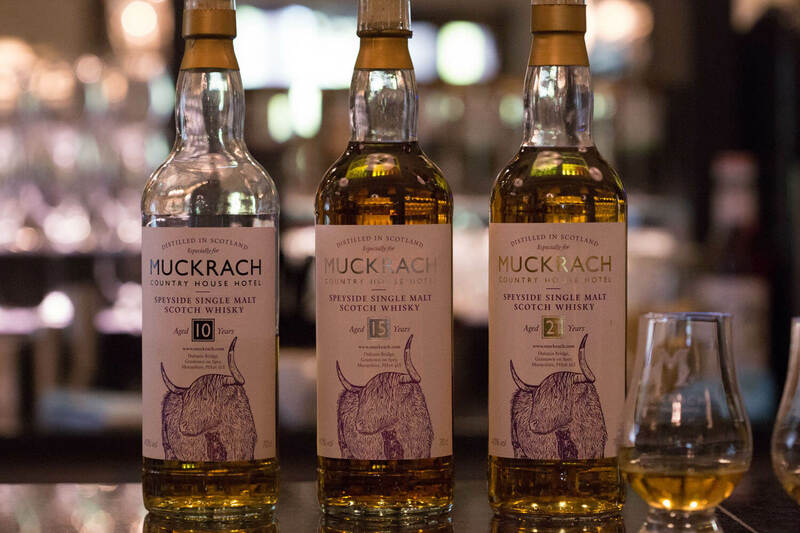 Muckrach Whisky is a single malt from a highly regarded Speyside distillery. Rich and mellow with ripefruit and toffee/fudge aromas. The fruitiness continues on the palate with a vanilla sweetness and delicate hint of smoke. 15 YEAR OLD SPEYSIDE SINGLE MALT SCOTCH WHISKY. Sweet malty aromas combined with Sherry notes. Rich fruit flavours with candied fruit and vanilla also present. 21 YEAR OLD SPEYSIDE SINGLE MALT SCOTCH WHISKY. Hints of ripe exotic fruits – mango, with a defined citrus note. Some spice develops. Each bottle is labelled with our in-house design of Archie the Highland Bull, Muckrach’s very own resident Highland Coo!